The Skinny: From the director of Arahan comes this winning drama about two men who get a second chance at life through the sport of boxing. Each character’s story could exist as a separate film, but by combining the two, director Ryoo Seung-Wan crafts a story that defies the conventions that viewers associate with boxing movies and divides our loyalties between the film’s two stars. Both Choi Min-Sik and Ryoo Seung-Bum turn in marvelous performances. The traditional underdog boxing story gets a Korean facelift in Ryoo Seung-Wan’s Crying Fist, a genre-busting box office smash about two men from different walks of life searching for a little redemption. Rather than focus on one boxer alone, the film explores two different fighters, both of whom are undergoing troubling upheavals in their personal lives. Ryoo Seung-Bum (from Arahan and No Manners) plays Yu Sang-Hwan, an angry teenage punk with a penchant for crime. His out-of-control antics result in constant brushes with the law, a pattern of behavior that eventually lands him in prison. His hot temper sparks a number of jailhouse fights, paving the way for his acceptance into the prison’s boxing program. While Sang-Hwan reluctantly steps into the ring to vent his frustrations, he soon finds that it may be his ticket out of his delinquent lifestyle. 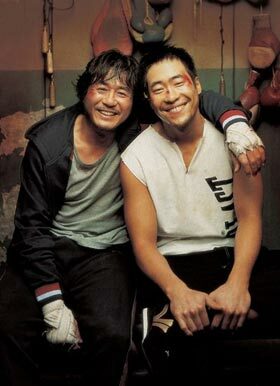 Choi Min-Sik (Old Boy), plays Kang Tae-Shik, the other half of the film’s boxing duo. Unlike the wayward youth Sang-Hwan, Tae-Shik is an older man going through a mid-life crisis of the most serious kind. Having once won the silver medal for boxing, Tae-Shik is now up to his ears in debt with creditors and various shady criminal types. With his family disintegrating and his money situation dire, Tae-Shik is forced to earn cash on the streets, utilizing his boxing skills in a most unconventional way. Rather than dish out punishment, Tae-Shik is forced to take it, offering himself up as a punching bag for any passerby who’s willing to pay the required fee. Crying Fist cuts back and forth between the two characters, as they both struggle to take back a measure of control in their lives. The film does a fantastic job of integrating the performances of Ryoo Seung-Bum and Choi Min-Sik into one powerful whole. Each storyline is worthy of its own movie, but director Ryoo Seung-Wan rightfully combines the two in order to avert formulaic notions associated with these kind of films. Most boxing movies focus on a singular individual, an underdog who trains hard for the big fight. Even the most pedestrian boxing film will still be able to earn a hefty measure of sympathy and loyalty from its audience in favor of the film’s protagonist. Crying Fist, however, succeeds in aligning the viewers with both of its protagonists, a circumstance which causes a peculiar kind of “problem” once the finale kicks in. If we as the audience recognize that each man desperately needs this win, who do we cheer for in the final bout?